April | 2016 | VAMboozled! Virginia SGP, also known as Brian Davison — a parent of two public school students in the affluent Loudoun, Virginia area (hereafter referred to as Virginia SGP) — has been an avid (and sometimes abrasive) commentator about value-added models (VAMs), defined generically, on this blog (see, for example, here, here, and here), on Diane Ravitch’s blog (see, for example, here, here, and here), and elsewhere (e.g., Virginia SGP’s Facebook page here). He is an advocate and promoter of the use of VAMs (which are in this particular case Student Growth Percentiles (SGPs); see differences between VAMs and SGPs here and here) to evaluate teachers, and he is an advocate and promoter of the release of teachers’ SGP scores to parents and the general public for their consumption and use. Related, and as described in a Washington Post article published in March of 2016, Virginia SGP “…Pushed [Virginia] into Debate of Teacher Privacy vs. Transparency for Parents” as per teachers’ SPG data. This occurred via a lawsuit Virginia SGP filed against the state, attempting to force the release of teachers’ SGP data for all teachers across the state. More specifically, and akin to what happened in 2010 when the Los Angeles Times published the names and VAM-based ratings of thousands of teachers teaching in the Los Angeles Unified School District (LAUSD), Virginia SGP “pressed for the data’s release because he thinks parents have a right to know how their children’s teachers are performing, information about public employees that exists but has so far been hidden. He also wants to expose what he says is Virginia’s broken promise to begin using the data to evaluate how effective the state’s teachers are.” He thinks that “teacher data should be out there,” especially if taxpayers are paying for it. In January, a Richmond, Virginia judge ruled in Virginia SGP’s favor, despite the state’s claims that Virginia school districts, despite the state’s investments, had reportedly not been using the SGP data, “calling them flawed and unreliable measures of a teacher’s effectiveness.” And even though this ruling was challenged by state officials and the Virginia Education Association thereafter, Virginia SGP posted via his Facebook page the millions of student records the state released in compliance with the court, with teacher names and other information redacted. This past Tuesday, however, and despite the challenges to the court’s initial ruling, came another win for Virginia SGP, as well as another loss for the state of Virginia. See the article “Judge Sides with Loudoun Parent Seeking Teachers’ Names, Student Test Scores,” published yesterday in a local Loudon, Virginia news outlet. The author of this article, Danielle Nadler, explains more specifically that, “A Richmond Circuit Court judge has ruled that [the] VDOE [Virginia Department of Education] must release Loudoun County Public Schools’ Student Growth Percentile [SGP] scores by school and by teacher…[including] teacher identifying information.” The judge noted that “that VDOE and the Loudoun school system failed to ‘meet the burden of proof to establish an exemption’ under Virginia’s Freedom of Information Act [FOIA].” The court also ordered VDOE to pay Davison $35,000 to cover his attorney fees and other costs. This final order was dated April 12, 2016. “Davison said he plans to publish the information on his ‘Virginia SGP’ Facebook page. Students will not be identified, but some of the teachers will. ‘I may mask the names of the worst performers when posting rankings/lists but other members of the public can analyze the data themselves to discover who those teachers are,” Virginia SGP said. I’ve exchanged messages with Virginia SGP prior to this ruling and since, and since I’ve explicitly invited him to also comment via this blog. While with this objective and subsequent ruling I disagree, although I do believe in transparency, it is nonetheless newsworthy in the realm of VAMs and for followers/readers of this blog. Comment now and/or do stay tuned for more. I wrote in two prior posts (here and here) about how in Alabama, just this past January, the Grand Old Party (GOP) put forth a bill to become an act, titled the Rewarding Advancement in Instruction and Student Excellence (RAISE) Act. Its purpose was to promote the usage of students’ test scores to grade and pay teachers annual bonuses (i.e., “supplements”) as per their performance, and “provide a procedure for observing and evaluating teachers” to help make other “significant differentiation[s] in pay, retention, promotion, dismissals, and other staffing decisions, including transfers, placements, and preferences in the event of reductions in force, [as] primarily [based] on evaluation results.” The bill was also to have extended the time to obtain tenure from three to five years, and all teachers’ test-based measures were to account for up to 25% of their yearly evaluations. Likewise, all of this was to happen at the state level, regardless of the fact that the state was no longer required to move forward with such a teacher evaluation system post the passage of the Every Student Succeeds Act (ESSA; see prior posts about the ESSA here, here, and here). As per an Association Press release here, the GOP leader of the Alabama Senate Del Marsh says that “he is shelving his education bill for the session after continued resistance to the idea of tying teacher evaluations to test score improvement…he was frustrated by the pushback from some education groups. This is great news for educators in Alabama, as well as potentially other states (e.g., Georgia, see for example here) regarding trends to come. See also a prior post on what other states in the south are similarly doing here. Reader Chiara has a great idea. It will turn [pro-VAM] professors against VAM. “I’m wondering if there’s ever been any discussion of ranking teachers by student test scores in higher ed. “It would obviously be more difficult to do, but one could use the tests that are used for graduate schools, right? How much “value” did undergrad professors add? Let us see the VAM scores for Raj Chetty, Jonah Rockoff, John Friedman, Thomas Kane, and all the other professors who endorse VAM. Be sure their ratings are posted in public. And while we are at it, all professors who testified against teacher tenure should give up their own tenure, On principle. Even though the professors listed above likely do not teach many undergraduate courses, the logic is much the same, not only about using such tests to theoretically hold them (and other) professors accountable, but also regarding tenure and the protections tenure bring also in higher education. Hence, this certainly is cause for pause. In June of 2014, defendants in “Vergara v. California” in Los Angeles, California lost their case. As a reminder, plaintiffs included nine public school students (backed by some serious corporate reformer funds as per Students Matter) who challenged five California state statutes that supported the state’s “ironclad [teacher] tenure system.” The prosecution’s argument was that students’ rights to a good education were being violated by teachers’ job protections…protections that were making it too difficult to fire “grossly ineffective” teachers. The prosecution’s suggested replacement to the “old” way of doing this, of course, was to use value-added scores to make “better” decisions about which teachers to fire and whom to keep around. In February of 2016, “Vergara v. California” was appealed, back in Los Angeles. Released, yesterday, was the Court of Appeal’s decision reversing the trial court’s earlier decision. As per an email I received also yesterday from one of the lawyers involved, “The unanimous decision holds that the plaintiffs did not establish their equal protection claim because they did not show that the challenged [“ironclad” tenure] laws themselves cause harm to poor students or students of color.” Accordingly, the Court of Appeal “ordered that judgment be entered for the defendants (the state officials and teachers’ unions)…[and]…this should end the case, and copycat cases in other parts of the country [emphasis added].” However, plaintiffs have already announced their intent to appeal this ruling to the California Supreme Court. Please find attached here, as certified for publication, the actual Court of Appeal decision. See also a post here about this reversal authored by California teachers’ unions. See also here more information released by the California Teachers Association. See also the amicus brief that a large set of deans and professors across the country contributed to/signed to help in this reversal. “Good news for schools using the Marzano framework,”…according to Marzano researchers. “One of the largest validation studies ever conducted on [the] observation framework shows that the Marzano model’s research-based structure is correlated with state VAMs.” See this claim, via the full report here. See also a standard model to categorize such correlations, albeit out of any particular context, below. 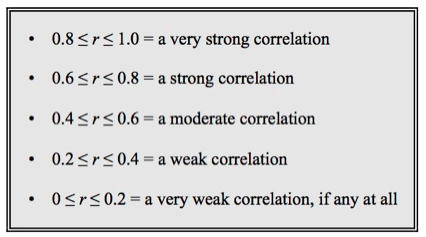 Using this, one can see that the correlations observed were indeed small to moderate, but not “strong” as claimed. Elsewhere, as also cited in this report, other observed correlations from similar studies on the same model ranged from r = 0.13 to 0.15, r = 0.14 to 0.21, and r = 0.21 to 0.26. While these are also noted as statistically significant, using the table below one can determine that statistical significance does not necessarily mean that such “very weak” to “weak” correlations are of much practical significance, especially if and when high-stakes decisions about teachers and their effects are to be attached to such evidence. Likewise, if such results (i.e., 0.0 < r < 0.4) sound familiar, they should, as a good number of researchers have set out to explore similar correlations in the past, using different value-added and observational data, and these researchers have also found similar zero-to-moderate (i.e., 0.0 < r < 0.4), but not (and dare I say never) “strong” correlations. See prior posts about such studies, for example, here, here, and here. See also the authors’ Endnote #1 in their report, again, here. As the authors write: “When evaluating the validity of observation protocols, studies [sic] typically assess the correlations between teacher observation scores and their value-added scores.” This is true, but this is true only in that such correlations offer only one piece of validity evidence. Validity, or rather evidencing that something from which inferences are drawn is in fact valid, is MUCH more complicated than simply running these types of correlations. Rather, the type of evidence that these authors are exploring is called convergent-related evidence of validity; however, for something to actually be deemed valid, MUCH more validity evidence is needed (e.g., content-, consequence-, predictive-, etc.- related evidence of validity). See, for example, some of the Educational Testing Service (ETS)’s Michael T. Kane’s work on validity here. See also The Standards for Educational and Psychological Testing developed by the American Educational Research Association (AERA), American Psychological Association (APA), and National Council on Measurement in Education (NCME) here. Instead, in this report the authors write that “Small to moderate correlations permit researchers to claim that the framework is validated (Kane, Taylor, Tyler, & Wooten, 2010).” This is false. As well, this unfortunately demonstrates a very naive conception and unsophisticated treatment of validity. This is also illustrated in that the authors use one external citation, authored by Thomas Kane NOT the aforementioned validity expert Michael Kane, to allege that validity can be (and is being) claimed. Here is the actual Thomas Kane et al. article the Marzano authors reference to support their validity claim, also noting that nowhere in this piece do Thomas Kane et al. make this actual claim. In fact, a search for “small” or “moderate” correlations yields zero total hits. In the end, what can be more fairly and appropriately asserted from this research report is that the Marzano model is indeed correlated with value-added estimates, and their correlation coefficients fall right in line with all other correlation coefficients evidenced via other current studies on this topic, again, whereby researchers have correlated multiple observational models with multiple value-added estimates. These correlations are small to moderate, and certainly not “strong,” and definitely not “strong” enough to warrant high-stakes decisions (e.g., teacher termination) given everything (i.e., the unexplained variance) that is still not captured among these multiple measures…and that still threatens the validity of the inferences to be drawn from these measures combined. Well, a colleague recently emailed me another such document authored by Kane (and co-written with four colleagues), titled: “Teaching Higher: Educators’ Perspectives on Common Core Implementation.” While this one is quite methodologically sound (i.e., as assessed via a thorough read of the main text of the document, including all footnotes and appendices), it is Kane’s set of claims, again, that are of concern, especially knowing that this report, even though it too has not yet been externally vetted or reviewed, will likely have a policy impact. The main goal of this report is clearly (although not made explicit) to endorse, promote, and in many ways save the Common Core State Standards (CCSS). I emphasize the word save in that clearly, and especially since the passage of the Every Student Succeeds Act (ESSA), many states have rejected the still highly controversial Common Core. I also should note that researchers in this study clearly conducted this study with similar a priori conclusions in mind (i.e., that the Common Core should be saved/promoted); hence, future peer review of this piece may be out of the question as the bias evident in the sets of findings would certainly be a “methodological issue,” again, likely preventing a peer-reviewed publication (see, for example, the a priori conclusion that “[this] study highlights an important advantage of having a common set of standards and assessments across multiple states,” in the abstract (p. 3). First I will comment on the findings regarding the Common Core, as related to value-added models (VAMs). Next, I will comment on Section III of the report, about “Which [Common Core] Implementation Strategies Helped Students Succeed?” (p. 17). This is where Kane and colleagues “link[ed] teachers’ survey responses [about the Common Core] to their students’ test scores on the 2014–2015 PARCC [Partnership for Assessment of Readiness for College and Careers] and SBAC [Smarter Balanced Assessment Consortium] assessments [both of which are aligned to the Common Core Standards]… This allowed [Kane et al.] to investigate which strategies and which of the [Common Core-related] supports [teachers] received were associated with their performance on PARCC and SBAC,” controlling for a variety of factors including teachers’ prior value-added (p. 17). With regards to the Common Core sections, Kane et al. lay claims like: “Despite the additional work, teachers and principals in the five states [that have adopted the Common Core = Delaware, Maryland, Massachusetts, New Mexico, and Nevada] have largely embraced [emphasis added] the new standards” (p. 3). They mention nowhere, however, the mediating set of influences interfering with such a claim, that likely lead to this claim entirely or at least in part – that many teachers across the nation have been forced, by prior federal and current state mandates (e.g., in New Mexico), to “embrace the new standards.” Rather, Kane et al. imply throughout the document that this “embracement” is a sure sign that teachers and principals are literally taking the Common Core into and within their open arms. The same interference is at play with their similar claim that “Teachers in the five study states have made major changes [emphasis in the original] in their lesson plans and instructional materials to meet the CCSS” (p. 3). Compliance is certainly a intervening factor, again, likely contaminating and distorting the validity of both of these claims (which are two of the four total claims highlighted throughout the document’s (p. 3)). Elsewhere, Kane et al. claim that “The new standards and assessments represent a significant challenge for teachers and students” (p. 6), along with an accompanying figure they use to illustrate how proficiency (i.e., the percent of students labeled as proficient) on these five states’ prior tests has decreased, indicating more rigor or a more “significant challenge for teachers and students” thanks to the Common Core. What they completely ignore again, however, is that the cut scores used to define “proficiency” are arbitrary per state, as was their approach to define “proficiency” across states in comparison (see footnote four). What we also know from years of research on such tests is that whenever a state introduces a “new and improved” test (e.g., the PARCC and SBAC tests), which is typically tied to “new and improved standards” (e.g., the Common Core), lower “proficiency” rates are observed. This has happened countless times across states, and certainly prior to the introduction of the PARCC and SBAC tests. Thereafter, the state typically responds with the same types of claims, that “The new standards and assessments represent a significant challenge for teachers and students.” These claims are meant to signal to the public that at last “we” are holding our teachers and students accountable for their teaching and learning, but thereafter, again, proficiency cut scores are arbitrarily redefined (among other things), and then five or ten years later “new and improved” tests and standards are needed again. In other words, this claim is nothing new and it should not be interpreted as such, but it should rather be interpreted as aligned with Einstein’s definition of insanity (i.e., repeating the same behaviors over and over again in the hopes that different results will ultimately materialize) as this is precisely what we as a nation have been doing since the minimum competency era in the early 1980s. Otherwise, Kane et al.’s other two claims were related to “Which [Common Core] Implementation Strategies Helped Students Succeed” (p. 17), as mentioned. They assert first that “In mathematics, [they] identified three markers of successful implementation: more professional development days, more classroom observations with explicit feedback tied to the Common Core, and the inclusion of Common Core-aligned student outcomes in teacher evaluations. 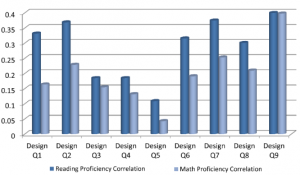 All were associated with statistically significantly [emphasis added] higher student performance on the PARCC and [SBAC] assessments in mathematics” (p. 3, see also p. 20). They assert second that “In English language arts, [they] did not find evidence for or against any particular implementation strategies” (p. 3, see also p. 20). What is highly problematic about these claims is that the three correlated implementation strategies noted, again as significantly associated with teachers’ students’ test-based performance on the PARCC and SBAC mathematics assessments, were “statistically significant” (determined by standard p or “probability” values under which findings that may have happened due to chance are numerically specified). But, they were not really practically significant, at all. There IS a difference whereby “statistically significant” findings may not be “practically significant,” or in this case “policy relevant,” at all. While many misinterpret “statistical significance” as an indicator of strength or importance, it is not. Practical significance is. As per the American Statistical Association’s (ASA) recently released “Statement on P-Values,” statistical significance “is not equivalent to scientific, human, or economic significance…Any effect, no matter how tiny, can produce a small p-value [i.e., “statistical significance”] if the sample size or measurement precision is high enough” (p. 10); hence, one must always check for practical significance when making claims about statistical significance, like Kane et al. actually do here, but do here in a similar inflated vein. In order to generate sizable and policy relevant improvement in test scores, (e.g., by half of a standard deviation), the observation and feedback index should jump up by 11 standard deviations! In addition, given that scale score points do not equal raw or actual test items (e.g., scale score-to-actual test item relationships are typically in the neighborhood of 4 or 5 scale scores points to 1 actual test item), this likely also means that Kane’s interpretations (i.e., mathematics scores were roughly the equivalent of 1.4 scale score points on the PARCC and 4.1 scale score points on the SBAC) actually mean 1/4th or 1/5th of a test item in mathematics on the PARCC and 4/5th of or 1 test item on the SBAC. This hardly “Provides New Evidence on Strategies Related to Improved Student Performance,” unless you define improved student performance as something as little as 1/5th of a test item. This is also not what Kane et al. claim to be “a moderately sizeable effect!” (p. 21). These numbers should not even be reported, much less emphasized as policy relevant/significant, unless perhaps equivalent to at least 0.25 standard deviations on the test (as a quasi-standard/accepted minimum). Likewise, the same argument can be made about the other three coefficients derived via these mathematics tests. See also similar claims that they asserted (e.g., that “students perform[ed] better when teachers [were] being evaluated based on student achievement” (p. 21). Because the abstract (and possibly conclusions) section are the main sections of this paper that are likely to have the most educational/policy impact, especially when people do not read all of the text, footnotes, and abstract contents of this entire document, this is irresponsible, and in many ways contemptible. This is also precisely the reason why, again, Kane’s calls for a Federal Drug Administration (FDA) type of entity for education are also so ironic (as explained in my prior post here).